Continuous Improvement is never ending !! 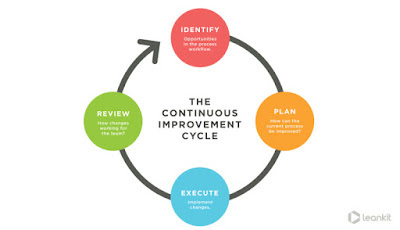 The 6 principles of Continuous Improvement is summarised here ..
6. Is improvement quantifiable ? : Any Continuous Improvement must be measurable and potentially repeatable. In the 5S cycle, Continuous Improvement (CI) comes in the Sustain phase - how do you ensure the momento is maintained ..
How can one look out for continuous improvement opportunities ? 1. Problems have opportunities, so look out for problemmatic areas. 4. Choose a simple solution, not the perfect one ..
5. Correct mistakes immediately, once and for ever ! 6. Use one's craftiness, not cash !! 7. CI possibilities are endless - there is no end to CI ..
As one of the most valuable and effective Lean Tools for value creation and wastage reduction in the long run, I am sure Continuous Improvement has the greatest potential to make the world a better place.